How do bits and bytes feel on your fingertips? Like your controller’s gravelly rumble when a video game football player gets tackled? Like bubbles of turbulence on an airline simulator control wheel? Like the rubbery resilience of 3D digital clay? Like the hairline cracks on a fragile archaeological find? Could they feel like varying and unique human tissues as a surgeon in London performs surgery on a patient in Johannesburg? You bet. What we’re talking about here is called “haptics,” a class of technology that most of us have experienced most commonly in the form of a vibrating cell phone. Haptic technology provides the user with kinesthetic and tactile force feedback from the digital world and, sometimes, true 3D navigation within it. By making it possible to “feel” virtual objects, haptics allow us to transcend a one-sided virtual experience, making for a more true-to-life, complete, and in some cases safer, interaction. And this capability, in tandem with the already-incredible potential of 3D, offers very cool, very beneficial medical applications. More on that in a minute. A bit about medical robotics first. Medical robotics have been used in surgical applications of various kinds since the mid 1980s and have proven beneficial for their precision, ease of use and ability to negate the shaking of tired hands. (See surgical robots like AESOP, ZEUS and the da Vinci Surgical System.) 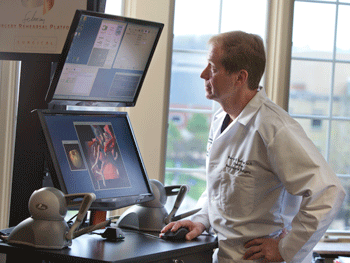 With these systems, the surgeon is typically in the operating room using the machine as an extension of his body. But starting with the Lindbergh operation – a cholecystectomy carried out by surgeons in New York on a patient in France – in 2001, it has become possible to perform remote surgeries across vast distances. Yet robotic-assisted surgery, especially telesurgery, isn’t used nearly as much as it could be. Why? In large part, because these systems haven’t been able to produce haptic sensations and force feedback. The main concern is patient safety. When the surgeon can’t feel what she’s doing, she’s forced to rely on her other senses to get her through it. The problem is, they aren’t as effective, and she’s left over-thinking about movements and tasks that should be automatic. As a result, the lack of touch can have an effect on the resolution of complications in the operating room, especially when the surgeon isn’t physically there. Touch alerts the surgeon that he’s cutting too deep before his sight can tell him it’s too late; touch allows him to regulate the minute moves of each instrument. At a higher level, the role of human touch in medicine cannot be underestimated because medicine is itself intrinsically human. That is, it requires one human to play the part of mechanic to other humans, to recognize the gravity of doing so, and to utilize the senses necessary to carry it out. Touch connects doctor and patient. This brings us back to haptics and the huge inroads that they’ll make in medical treatment. Imagine a telesurgery interface so realistic that our London-based surgeon can feel the resistance of an incision, the puncturing sensation of an arthroscope, and the tug of sutures on a patient a continent away. Imagine specialists in world-renowned hospitals being able to safely treat patients in remote or underserved locations, allowing the patient to stay closer to home and receive treatment he or she might not otherwise get. It’s not so far from reality, as the Lindbergh operation demonstrated. Also, take this into account: Just this past April 30, doctors at Boston Children’s Hospital performed the first-ever “blindfolded” surgical simulation in which the surgeon performed a simulated robotic-assisted procedure using nothing but his sense of touch. They used haptics to make it possible. It’s only a matter of time until networking capabilities, robotics, medicine, and haptics come together to put this into common practice. In the mean time, surgeons are already actively using haptic devices and patient-specific 3D virtual models to plan complicated surgeries, rehearse procedures, and pioneer new techniques. Haptic technology is even being used to sculpt and design cutting-edge medical implants and verify their fit prior to implantation. With the sense of touch, a bright medical future is, if I may say, palpable. As these developments demonstrate, we inventors are striding ever closer to a place at which reality melds with the bits and bytes of the digital world. We can sculpt digital designs with our hands. We can be in two places at once with telesurgery. We can experience emergencies and complications before they arise. We are progressively discovering options that have long existed under the guise of impossibility. Impossible is fleeting. Keep inventing.